A scuba mask is essential to protect the human eye and allow you to focus under the water. There are various ranges of scuba masks with different volumes that determine the amount of air space within the scuba mask. The best scuba mask for beginners is the ScubaPro Spectra Low Volume 2 Window Dive Mask with 6 different colors and use of high quality materials throughout. Many beginners make the mistake of using a snorkel mask for diving. A scuba mask is what you want for diving because it has a strong seal to prevent leakages and has anti fogging properties so that you have a clear sight of vision. Scuba masks need to be adjustable as not everyone has the same faces. 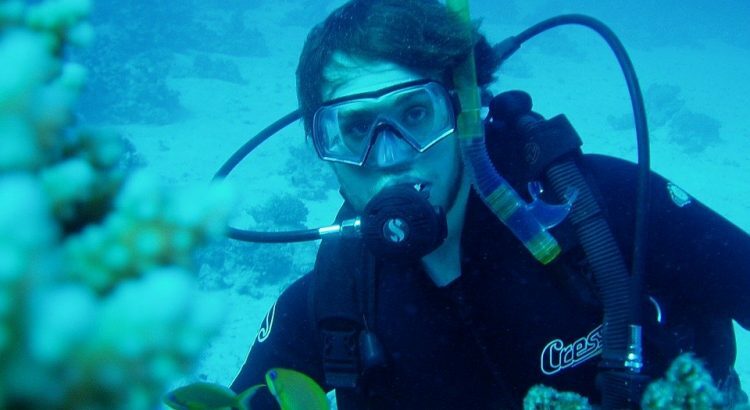 For examples, scuba masks need to be design for large faces, small faces, bearded men, large noses and even include prescription lenses. On top of this, scuba masks need to be comfortable without any pain or irritation caused to the person wearing it. Many include unique features that ensure they do not come fogged up easily unlike many of the cheap scuba masks. There are many scuba masks available online but be very cautious because many are not up to the job. Below is a list of the best scuba masks for beginners that can be used for diving, swimming in the sea and many more activities. Straight in with a premium scuba mask is the ScubaPro Spectra 2 which is well known for being the most comfortable scuba mask available. It is on the pricey side in terms of scuba masks but this results in higher quality materials used. Comfort was always a big factor for myself when purchasing a scuba mask and the Spectra 2 is the best for comfort. The skirt of the mask is very soft and provides an excellent seal to provide a leak free dive. The 2 window tempered glass design of the scuba mask makes it easier to clear and equalize. When purchasing a two window mask, its important that the mask frame doesn’t push against the bridge of your noise for a perfect fit. The ScubaPro Spectra 2 is also low volume, which means the glass is much closer to your face. This means that there will be less air volume from within the mask, making much simpler to clear. In terms of adjusting the fit, this scuba mask has swivel buckles attached to the skirt to adjust the fit around your head. The spectra 2 can be bought in a range of colors but we recommend sticking to dark colors (particularly the rubber) to reduce reflection when there is direct sun on the waters. The fit and comfort is the most important factor when buying a scuba mask and the Spectra 2 has a great big tick in that department. One of the best things about a GoPro is that they are waterproof. Therefore, whilst scuba diving within a public place, you will probably see a fair few divers with GoPros attached to their scuba masks. There are 2 ways you can attach your GoPro to your scuba mask. The first is by purchasing a dedicated GoPro scuba mask with the proper attachment or you can use a 3M sticky pad against your scuba mask. The 3M pads are great but not in the water and certainly not when attached against a scuba mask. For starters, when they are removed from the scuba mask they are attached too, there will 100% be damage to the mask. Secondly, the majority of masks do not have a large enough flat space to place the 3M pad. Octomask have overcome this problem by producing the best scuba masks for GoPro’s that will work with all models (and other devices). The GoPro mount, aluminium thumbscrew and a travel bag are all part of the package. The universal fit scuba mask uses a soft silicone skirt for a comfortable non leak experience. The low volume design means that the mask is close to your face for additional visibility and easy clearing of fogging. If you own a GoPro and are going scuba diving, this is the perfect scuba mask for you. The Cressi Pano 4 features side glass in a four way panoramic design for maximum visibility. More light and a great field of view results in a much great experience when scuba diving underwater. You would think that a scuba mask with side glass would be fairly expensive. However, the Cressi Pano 4 is an affordable scuba mask for most budgets that doesn’t look or feel cheap. The low volume design is made from lightweight rigid material and is mated with a liquid silicone skirt. The silicone skirt is high quality and built to last but at the same time be comfortable. The 4 glass screen within the scuba masks gives the best peripheral vision however many brands use large seams to connect the glass. Not Cressi, as you can see from the image above, the seam between the main glass to the side glass is tiny. If you have been scuba diving before where you have used a scuba mask, you will understand how annoying bright reflections are. The marine brand Atomic have conquered this problem with a scuba mask dedicated to reduce glare with an anti-reflective coating upon the glass. The ARC Technology reduces reflected light but increases the amount of light available to a divers eye. This improves the vision of the scuba diver massively on sunny days with plenty of reflected light. Another big feature and why this scuba mask is within the premium category is due to its strength. Thanks to a stainless steel sub frame which locks the lens in place, the frame is virtually indestructible. The manufactures are that confident, the scuba mask comes with a lifetime warranty against breakage. The Atomic Aquatic scuba mask is highly rated worldwide and although its slightly expensive, it provide a lifetime warranty and is everything you can ask for in a scuba mask. The Aqua Lung Scuba Mask is a single lens design to give a full view of what is ahead of you. Using a silicone skirt, the fit is universal and provides a secure yet comfortable fit without any leaks. The classic design was primarily required by the military and the single lens is made from a strong blend of tempered glass. If you are looking for the ultimate peripheral vision without side lenses, this is the scuba mask for you. When using this mask on holiday in the South of France, I found that the suction was very strong but it did tend to fog up. However, if these were my scuba masks (they were rented on holiday) I would have treated the lens to an anti-fog method before using them. Before you purchase a scuba mask, it is prudent that you understand what it is that you need to look for, so you are able to purchase the best scuba mask for your needs. You want to be sure that you are purchasing a scuba mask that you are comfortable with, that is going to give you the best view, and that you are going to be satisfied with the results that you achieve when you are using your scuba mask. Of course, you will want to look the best when wearing a scuba mask but you shouldn’t forget that it needs to be comfortable when wearing it underwater. When the scuba mask is on your face, there doesn’t need to be any gaps around the skirt area of the mask. You need to be sure that the mask fits up against your face with no gaps for any water to leak through. Once you have found the right fit for you, then you can take time to find the color and design that you wish to wear. If you are having trouble finding a mask this fits your face perfectly, then it is prudent for you to be sure and ask an associate in the store, or a professional when it comes to finding what you need. Don’t just choose a random mask and hope for the best, it needs to be the perfect fit before you purchase a scuba mask. If you ask a regular scuba diver which strap is the most comfortable, the majority will tell you that a neoprene strap is more comfortable than a silicone one. However, it isn’t the best decision to make. Even though silicone straps on a scuba mask are not as comfortable to wear, they do not slip on your face when you wear it. Neoprene straps are comfortable but not able to keep from the mask from slipping, whereas, silicone straps are slip-resistant. When you come to the decision about whether you should purchase a snorkel mask or a scuba mask, the answer will always be a scuba mask. If you are looking to dive, and to descend down to deeper levels of the water, then a scuba mask is the option to choose. These masks have a skirt that encloses around the face of the person wearing it, and the glass is a strong and tempered one for safe descending. The volume is referring to the amount of air space that is inside of the mask. A low volume mask, is closer to your face when you wear it, and you are able to clear it of water very quickly. High volume masks extend your peripheral vision, and gives you a more openness when you are looking through then. However, a high volume mask takes a bit more effort to clear it of water unlike to quick clearing of the low volume. The decision will be left up to you to decide which you would prefer to work with when you are scuba diving. You will have to consider whether or not you are looking to purchase a scuba mask that you are intending to keep for yourself, or if you are only looking to rent one for an activity. Either way, you will still need to find the perfect fit for you before you use this scuba mask. If you do not have room to travel with a scuba mask, or you forgot to bring yours on your trip, then renting one is going to be the other option that you have. You will need to be sure that you find the perfect fit, or you will not be able to experience the underwater world the way that you should be able to. Prescription Glasses or Contact Lenses Users – it might be an important aspect to consider optical inserts, or prescription lenses, when you purchase your scuba mask. You are going to want to be able to see clearly as you view the waters below you, and it is also safe that you are able to see your surroundings clearly. So, if you are in need of a prescription scuba mask, then it is prudent that you make sure and purchase one that is perfect for your eye sight. Prevent unwanted fogging in your scuba mask – 2 main tactics are to scrub the inside of the lenses with toothpaste or a non-abrasive cleaner. However you can also read more depth on how to prevent fogging inside your mask. Always keep your scuba mask out of the direct sunlight. After each use, always rinse it with fresh water – Keeping your scuba mask clean is going to give you a clear view of what you are looking at under the water. It is also sanitary to keep your mask clean, so each time you use it, you can rest assured in knowing that it is clean and sanitized each time that you use it. Never over-tighten your mask – Over-tightening your mask can cause leakage to occur when you are using it. Leakage is something that you want to try and avoid when it comes to using a scuba mask, because you need to be able to see clearly, and not have to keep continually clearing your mask of water. Store your scuba mask in a plastic container – bugs are attracted to silicone, and they can damage your scuba mask. These tips are necessary to keep your scuba mask in the best condition possible, so every time that you are ready to use it, they are in good shape and ready to be used. Scuba masks are not cheap pieces of equipment for you to use, therefore, you are going to want to take care of your mask properly. You need to be sure that you are going to be comfortable with the lenses that you choose, and that you are comfortable with the results you will experience, and the pros and cons of the different lenses that you can choose. This part of the decision making process is a crucial one, and it is the decision that is going to be what gives you the overall outcome of your under water excursion. Whichever amount of lenses it is that you are wanting to find in a scuba mask, always be sure to check for any type of flaws or cloudiness in the lenses. These flaws in the lens will end up magnifying once you are under the water, and this can become a hassle for you to deal with, and as a safety hazard as well. Always keep in mind of the profile of the mask itself as you decide on the number of lenses that you prefer to have. If a mask has a higher profile design, then the chances are it is going to drag when you are using it under the water. If there is a leak that causes water to enter your mask while you are using it, then there is a greater chance that much water is going to enter your mask during this flood. A lower profile mask is beneficial for you when it comes to leaks. This will help you to be able to clear the water quicker and easier than that of a higher profile. In lower profile masks, there is a lot less space for the water around you to have to fill, and this means less water to have to clear from your mask and allow you to be on your way. Every scuba mask is going to cause some type of visual distortion to your surroundings, and if you have a lower profile mask, then it will be able to reduce the amount of visual distortion that is created. A higher profile mask is going to cause a greater amount of visual distortion for you. Single lens scuba masks are going to have less space for water to get into, and this is something that several diving individuals are looking to find. However, there are many scuba divers who are not as concerned with the water leaks, and they are looking to achieve a higher amount of visual while they are under the water. Therefore, they are looking to find a dual lens scuba mask to help them achieve this ability successfully. So, depending on what it is that you are looking for when it comes to the activity itself, and what you are looking to achieve, will help you to decide on which type of lenses are going to work the best for you. Single lens masks are often used and worn by individuals who have a smaller face, and for those who are distracted by peripheral vision as well. If you are one of these individuals who is looking to get a direct and clear view of your surroundings under the water, then a single lens might be the right decision for you to make. Dual lenses offer a wider range of view when you are using them. They allow you to see all of the activity taking place in your peripheral vision. You can purchase a scuba mask with two, three, four, five, and even a six lens design. Before making your decision on a single or dual lens scuba mask, the best thing to do, is to try on different masks with different amounts of lenses in them, and then make your decision on which mask is going to suit you the best, and give you the results that you are looking for. As you are diving under the water, if your mask ends up fogging or steaming up on you, it can initially ruin the entire dive for you. Even though there are several ways to help with fogging inside of your mask, steaming and fogging will always occur. If this happens during a dive, you won’t be able to do anything about it until you get back to dry land and take care of the issue. There are a few tips that can help you to prevent fogging and steaming from occurring whenever you are using your mask under the water. Cleaning your mask is something that will help to prevent any type of fogging, however, even if your mask is clean, it can still fog and steam up on you. So, if this is happening, one of the ways to help prevent fogging is to use baby shampoo. Using baby shampoo to clean out your scuba mask, is an amazing de-fogger for your scuba mask, and if you decide to use this, then it is important to remember that once you have finished cleaning the lens, you will need to wash it out thoroughly. You will not have to use a lot of the baby shampoo to accomplish a good cleaning of the lens, so you will have plenty left over to use over and over again. Any scuba mask that you by is going to have a protective sealant over the lenses, and this is what makes them fog or steam. However, even an old mask can fog and steam if it has water spots on it, salt spots on it, or even if it hasn’t been cleaned properly. There are an unlimited amount of products on the market that you can find as a de-fogger, however, one of the most efficient ways to clean your scuba mask is toothpaste. It might sound funny to use toothpaste on your mask, but it has been tested and proven to work efficiently when cleaning and removing dirt from your scuba mask. However, do not use any toothpaste that has whitening agents in the mixture of it, because these agents will damage the lenses. Purchase a cheap brand of just regular toothpaste, and it will be able to get the job done for your successfully. One of the facts that we often don’t realize, is that the heat from our faces is what causes the mask to fog up in the first place. A very good tip to use, is to first stick your face into the water and cool the temperature down in your skin. Then once you put the mask on after taking this action, your face will be cool enough to keep your lenses from fogging up on you, and causing a hassle for your dive. It is important to be sure and always keep de-foggers or toothpaste with you for each dive that you participate in. If you find that you are having some issues under the water, once you have resurfaced, you can take care of the issue once you return to the surface of the water. Keeping these with your gear, gives you something to use to clean your scuba mask with while you are on your dive, and it will help you to accomplish a better scuba diving experience.